Mobvoi Ticwatch S and E review: What more could you want from a smartwatch? Mobvoi recently presented a new pair of watches, this time equipped with the most common Android Wear, and with a competitive price. Is it worth getting one? We’ve tested them out, so here is our review of the most talked about smartwatch right now! Both watches are available to purchase on the official Mobvoi website at a price of $199.99 and $159.99 for the ticwatch S and ticwatch E. A 20% discount code is also available if you buy it here. Ticwatch S (S stands for Sport) is available in Knight (black) Aurora (Yellow) and Glacier (white). All three versions have a black ring with numbers printed in the yellow color, same as the Aurora verson. Ticwatch E (E stands for Express) is available in the same colours but with different names: Shadow, Ice and Lemon. On Ticwatch E you don't have the numbered ring, but on the other hand you can change the strap, which is not possible on the sports model, as it has GPS antennas inside the rubber bands. For this review, we received the Tickwatch S in ‘Aurora’ and Ticwatch E in Ice colour. Ticwatch Express has a classic and simple design. In the Ice colour I received, the 44 mm case (and 13.5 mm thick) is made entirely of transparent glossy plastic that surrounds a second layer of white plastic. Visually, it looks great, but you can immediately feel that the material may not be very resistant and is somewhat reminiscent of some of the cheaper Smartwatch models from the early '90s. The bracelet itself seemed fragile, but at the end of the testing there was no damage or signs of wear, so I could be wrong. The strap is made of rubber with an almost velvety finish, which makes it easy to fasten and does not move or feel uncomfortable once on the wrist. The Ticwatch Sport differs in terms of the overall size, which is up to 45 mm. At the same time, it is slightly thinner at 13 mm, however, both watches are quite bulky. Around the display there is a fixed numbered ring nut, which I thought looked great. Both the case and strap are highlighted in yellow with a matt finish in the Aurora version. After only a week, there was already a difference in colour between the plastic case and the rubber strap that began to darken. So overtime, you can expect to see the wear and tear. All in all, the design and construction of the two smartwatches is not so bad and given the reduced cost I certainly didn't expect more valuable materials. I want to emphasize the fact that I'm absolutely not disappointed by the quality of smartwatches, just don't expect the quality level of a Gear Sport or Gear S3. One unusual feature on both Ticwatches, is that the button is located on the wrong side of the watch, I don’t think this a terrible thing, but it might be irritating for some as you will have to place your wrist in a slightly uncomfortable position, covering the display with your hand. I would say the Ticwatch E is the best in this instance, as the button is more accessible and handles better overall. The Ticwatch S weighs 45.5g and the Ticwatch E stops at 41.5g; both are protected from splash water with IP67 certification. Both watches feature a scratch-resistant protective glass. I used the smartwatches during many day-to-day things (maintenance of PCs, moving furniture, washing dishes) and despite some small knocks on the glass, both came out unscathed. The visibility in the sun is very good especially when compared to some LCD displays of the competition. In the dark, brightness is not disturbing. The only complaint I have about the display is that neither of the two watches has an automatic brightness sensor (unlike the Moto 360). During the test the touch screen has always reacted very well to the controls even with the screen slightly wet, which was a pleasant surprise. Android Wear is certainly not a novelty and Google is not introducing many new features to the platform after its advancement to version 2.0. Despite Google's lack of functionality updates, the Ticwatches feature Android 7.1.1 with October's security patches and will apparently be updated in Oreo. Since i’ve had then, I already received two different OTA updates on both watches, which shows the company's interest in supporting the product (other more famous companies seemed to have abandoned their products). Mobvoi's only software additions are for step counter, heartbeat detector and charts for monitoring activities during a day. These functions can be deactivated if you use Google Fit like me. The addition of the company's specific dials specifically designed for the two watch models, which perfectly match the colours of the bracelets and case. Ticwatch Express and Sport share the same internal hardware. The only difference is that the S version has GPS. Both have a dual-core Mediatek MT2601 dual-core CPU with a frequency of 1.2GHz. Normally I'm not satisfied with the operation of the SoC Mediatek, but this time I changed my mind: the chip responded well and provided smooth performance consistently. The RAM is 512MB and the internal memory is 4GB for apps and music to listen with Bluetooth headphones. In more expensive models the accelerometer, gyroscope, compass, proximity sensor and optical heart rate reader for hardware equipment functions at the same level. Of course, heart rate monitor readings are generally not accurate and therefore you should take those readings with a pinch of salt. Another feature includes a vibration motor for. There is also a vibration motor for notifications. To connect to the smartphone, the two watches use Bluetooth 4.1 BLE and can connect to the internet for receiving notifications and updates also via WIFI antenna 802.11 b/g/n. Both watches are equipped with microphones and speakers. You'll not only be able to give commands to Google Assistant but you'll also be able to answer and make calls directly from your wrist. The microphones work well, they are fast to respond and Google Assistant works just like any other platform. Speakers have enough volume to make a call in low noise situations such as driving, but the sound quality is not high. I would not recommend using it in a crowded place as you won’t be able to hear the conversation, and of course people could eavesdrop on your conversation! Another great feature, is that you can download music with Google Play Music for listening via bluetooth heaphones. This could be useful if you go running while leaving your smartphone in the car or at home. Mobvoi's two smartwatches are powered by a 300mAh battery that has proven to be more than enough in everyday use. Don't be afraid to use Google Assistant or respond to notifications via voice commands, the battery will definitely support you for a full day. In most cases even two days can be easily reached with normal use. Using the GPS of the Ticwatch S, the hours of use drop significantly but you will probably be able to reach your destination before the battery runs out! Charging is done by a magnetic connector. Unfortunately, if you break this cable, you cannot purchase spare parts. In addition, the magnets that connect it are not that strong and therefore disconnect if badly positioned. During the testing I wanted to charge one of the smartwatches overnight and woke up to find a low battery. Mobvoi has certainly proved to have learned from its past experiences with his Ticwatch and Ticwatch 2. After experimenting with various software, the company decided to rely on the most popular Android Wear and embrace an ecosystem already appreciated by developers. Even without the discount code, Ticwatch S and Ticwatch E are the champions of quality/price ratio and as the first smartwatch are more than recommended. Don’t expect elegant and luxurious devices, but they are more than suitable for young people and sportsmen. In their price range, they are the best buy. 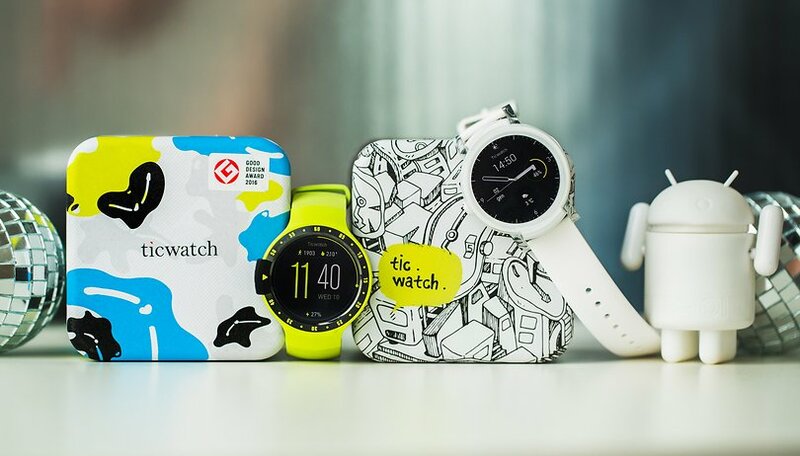 If you are looking for your first smartwatch, a device to be used for day-to-day activities, sports, or just an accessory to accompany your smartphone, then I would really recommend Ticwatch Express and Ticwatch Sport. We only hope that the company, like many other startups of the past, does not stop the software support. Both E & S have a GSP. E in the case when S have it in the strap. I'm guessing this is sponsored? I have the E. Wore it 3 times. Battery lasted about 3-4 hours. Just a few notifications and no always on screen. Stay away from this McDonald's toy.